Wow them with these giant peanut butter cups that celebrate America's favorite flavor pairing: chocolate and peanut butter. 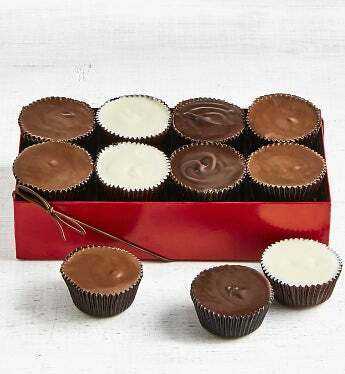 A thick shell of rich, dark Belgian chocolate, , smooth milk chocolate and creamy white chocolate encase a homemade, rich peanut butter filling. It's the ultimate decadent peanut butter cup! Wow them with these giant peanut butter cups that celebrate America's favorite flavor pairing: chocolate and peanut butter. A thick shell of rich, dark Belgian chocolate, , smooth milk chocolate and creamy white chocolate encase a homemade, rich peanut butter filling. It's the ultimate decadent peanut butter cup! 8 cups - 2 pounds total!